There is something entrancing about a rabbit hole. Not a literal one (well, that, too—there might be baby bunnies in there! ); the rabbit holes that fascinate us at M+R are questions that start simple, and then quickly get very, very deep. This is one we keep hearing: does brand awareness impact online fundraising? The gut answer is yes, of course! Effective brand awareness campaigns will absolutely improve online fundraising. Get the word out, elevate your visibility, watch the donations roll in. It’s a nice, intuitive hypothesis—which is exactly why we can’t trust it. More questions rush in behind; the rabbit hole deepens. Do we know that’s true? Really know it? Like, with data? What is the size of the online giving impact of the activities that drive brand awareness? How do we (or how would we) measure that impact? Are there differences between earned and paid media? Is a nonprofit doomed to failure if they have low brand recognition? Does a nonprofit with high public awareness have a direct line to donors’ wallets? If we invest a gazillion dollars into a brand campaign, will we see a lift to digital fundraising? How big? How long will it take? How deep does this go? See what happened there? The pull is too strong, we cannot resist. Let’s grab our data and go exploring. We took three years of data, broken down by month, from six leading nonprofits. Because end-of-year fundraising can drastically skew fundraising strategy and results, we excluded those months from our dataset, leaving us with about 180 months of data for each data point. We looked for correlations between those data points and what we generally refer to as “White Mail” in the offline world, or “unsourced website revenue.” These are donations coming from people who visit your website without any trackable direct marketing source. This measurement of “White Mail” is a proxy for brand awareness, rather than a direct measurement. Typically ‘brand awareness’ is measured by conducting a poll or survey of the general public, often via telephone, which can be quite expensive. Many nonprofits might conduct this sort of brand research on an annual or every-few-years basis—which means we weren’t able to gather consistent monthly data across all of these 6 nonprofits because they don’t all collect this data in the same format on a regular basis. However, fear not! This year M+R is piloting an ongoing, quarterly survey to measure brand awareness among a select set of our clients, and we hope to use that information to inform future analyses. Stay tuned. In the meantime, this study looks at a few of the primary marketing activities that are likely to drive brand awareness, and then the impact of those activities on unsourced website giving. Please bear in mind that a correlation is just that—it shows that these two numbers correlate with one another. It is not necessarily evidenced that changing one variable will cause the other data point to move. To try to nail down causation, we would ideally run some scientific tests that could control for all other variables. For our purposes, we only looked at correlations that had a moderate (.5 to .69) or strong (.7 or higher) linear relationship. If you’re not sure what all that means or would like a brief refresher on correlation coefficients, here’s a nice summary for a fun Friday night read (and if you think this is fun, you might want to check out our open positions). 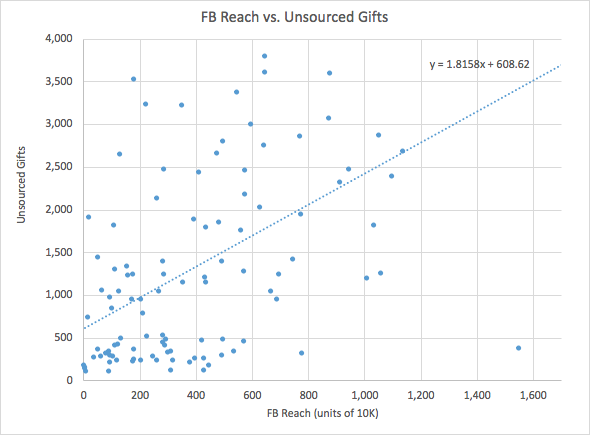 We saw a moderate correlation between Facebook reach and the number of unsourced website gifts (hereafter “unsourced gifts”). For each additional 10,000 people reached on Facebook in a given month, our study participants received an additional 1.8 unsourced web gifts. That may not sound like much, but some of the study participants had months where their Facebook reach was between 1 and 2 million; even a small correlation can mean thousands of additional gifts. Bear in mind that statistically this was a moderate—not strong—correlation, so it is always possible that this was due to chance or other factors. 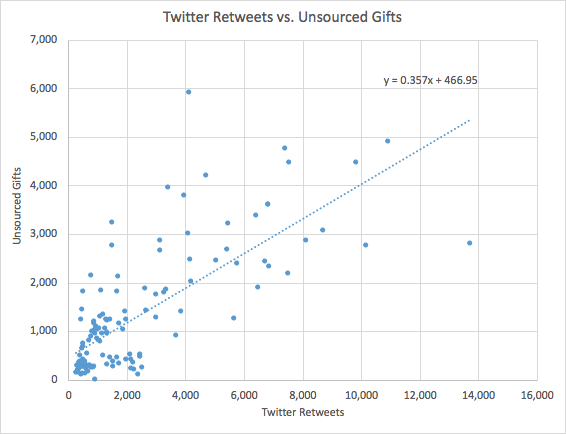 Our data showed a strong correlation between the volume of retweets and giving—every additional retweet on Twitter correlated to 0.4 additional unsourced gifts. We were very excited to include data from our most recent Mediamarks Study, which shows the number of press hits in the top 50 media outlets for a number of leading nonprofits, broken down by month. Based on our own real-world work experience, we expected to see a clear correlation between media coverage and unsourced gifts. Remember what we said about trusting nice, intuitive hypotheses? Whomp, whomp, we found no correlation at all (either positive or negative) between media coverage and unsourced revenue. This is a twist that is just crying out for further exploration. For the time being, we think this may be because the data tells us a lot about the quantity of media coverage a nonprofit receives, but it doesn’t really evaluate the quality of the media hits. For instance—we don’t (yet!) give extra weight if the nonprofit is the star of a story (versus only being mentioned toward the end). And although Mediamarks does look at whether the purpose of a media hit is for fundraising, we don’t score how compelling of a case the article makes for giving. Just because our data pool isn’t making the connection between press and fundraising doesn’t mean it doesn’t exist. It may just mean we need better, more sophisticated data (to be fair, we pretty much always want better, more sophisticated data). Anecdotally, we’ve had a number of clients receive high-quality and fundraising-relevant media coverage that has led to significant spikes in giving. For instance, the World Food Programme (WFP)’s work was featured on the TV program “60 Minutes” last year. For the next 24 hours, WFP USA saw a spike in donations over 2,000% higher than their average 24-hour period. Another M+R client was unexpectedly featured on television when a celebrity emotionally and emphatically praised them. That month, the organization saw 388% growth in online donations above and beyond what they would normally expect. Now, obviously not all media coverage is created equally—these two examples were quite extraordinary. But we suspect that many smaller media opportunities can add up to increased brand recognition that will, ultimately, lead to additional giving online. Stay tuned for a future study where we dig in a bit deeper on this topic! We do a lot of media buying for our clients, which means we keep a pretty close eye on the connection between digital advertising and revenue. So we weren’t too surprised at finding moderate to strong correlations between digital advertising impressions (and spend) and unsourced revenue. 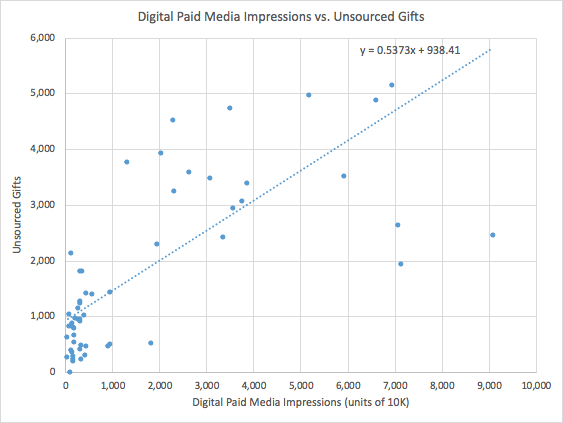 For each additional 10,000 digital paid media impressions, we saw an additional .53 unsourced gifts. Given that some of these nonprofits were running millions of media impressions in any given month, the increase in giving was substantial. It’s also worth noting that we tracked only unsourced website revenue—this does NOT look at any additional revenue that is direct click-through revenue OR revenue from paid search—which often makes up a substantial portion of revenue from display advertising. In other words, this is not a direct estimate of returns from digital advertising—the actual impact of paid media is typically significantly higher. Most of our study participants were not able to share data about their offline media spends (or donated media), so we unfortunately had relatively little data to work with on this front. The one offline media activity that we did see a very strong correlation with unsourced revenue was in donated cable television advertising. Every 1,000 units of donated TV advertising correlated to a $90 increase in unsourced revenue. We have some answers—and even better (or at least more typical) than that, we have new, intriguing questions. We did find a significant correlation between social media activity and unsourced giving, and between paid digital advertising and unsourced revenue. But we think there’s more to be found here, particularly in the areas of earned media coverage and offline advertising. So we’re going to keep digging. We’re going to gather more data so we can keep testing our assumptions and putting our conclusions on firmer footing. We’re going to find ways to layer in additional points of contact with the public that could have a major impact on brand awareness, such as street canvassing and direct mail. And we’re looking forward to longitudinal tracking that will incorporate ongoing quarterly or monthly brand tracking. We’re not done following this particular rabbit hole. Keep in touch to find out where it leads.